Wait Application Method in VBA is used to pauses or stop a running macro until a specified or mentioned time. It returns a Boolean value either true or false. If the specified time arrived, it returns true otherwise it returns False. Here syntax for Wait method of application object in VBA. Time: It is a required parameter. It specifies the time at what time you want to resume the macro. In the above syntax Application represents object and Wait is the method of Application of Application object. 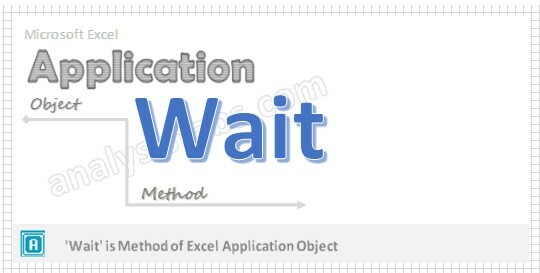 Please find the below example for Wait method of application object in excel VBA. Application. The below macro Pauses an application till 4.00 PM today. Application. The below macro Pauses an application for 20 seconds from now. after 60 seconds or 1 hour. MsgBox "Your session has expired"
Step 6: First time run the macro in debug mode (Press F8) to observe the Wait macro result. Hello, I have a question and would like your comment. Excel has a bug of memory leakage in OLEDB and the solution is to restart Excel. I have successfully written a VBA scrip to kill the EXCEL32 process, then open the workbook and run the macro. Is there anyway to use application.wait or other commands to delay the opening and running the macro after the completion of killing of process.